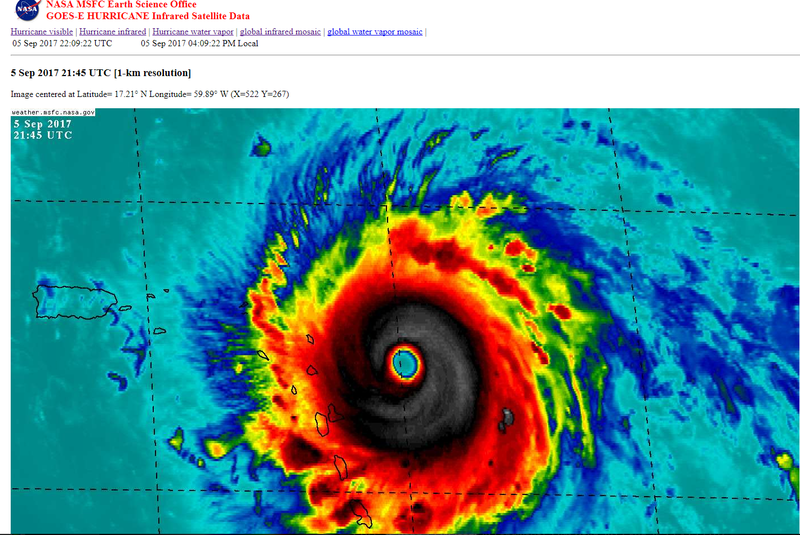 Historic & Dangerous Category 5 Hurricane Irma Continues To Strengthen! Intense Category 5 Hurricane Irma. Captured At 3:45 PM MDT This Tuesday Afternoon. 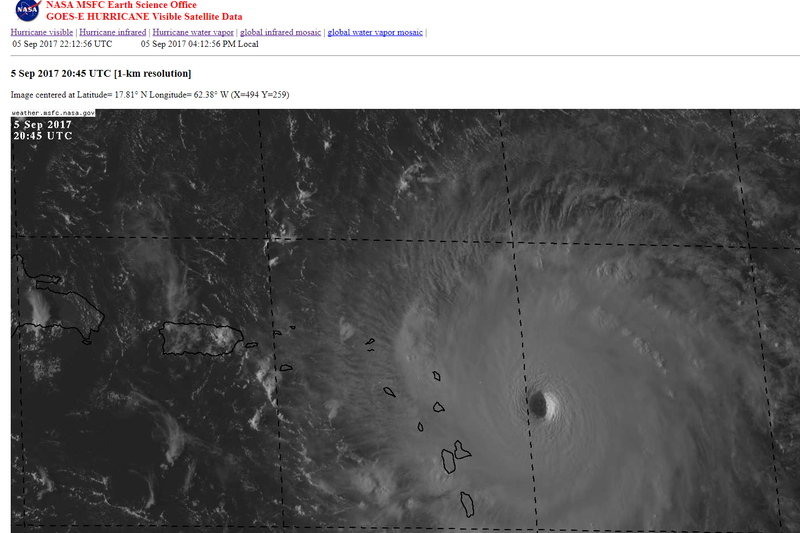 Visible Satellite Image Of Irma. Captured At 2:45 PM MDT This Tuesday Afternoon. Update: At 5 PM MDT Category 5 Hurricane Irma still had sustained winds of 185 mph with gusts to 225 mph. 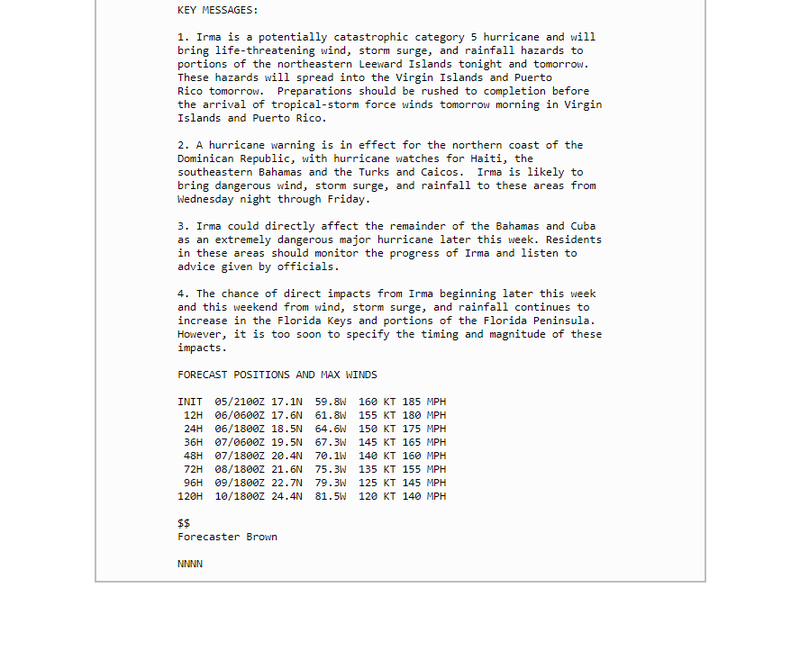 But her central pressure had fallen from 926 millibars or 27.35 inches of mercury at 2 PM MDT to 916 millibars or 27.05 inches of mercury! 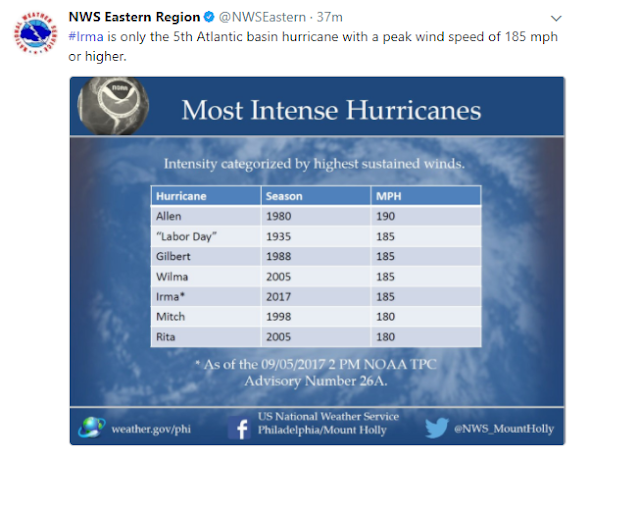 Hurricane Irma made the record books this afternoon as one of the most intense Hurricanes ever recorded in the Atlantic Basin (1851-2017). As of 2 PM MDT she had sustained winds of 185 mph with gusts to 225 mph. Her central pressure had fallen to 926 millibars or 27.35 inches of mercury. She continues to clip along to the west at 15 mph. Irma is forecast to remain a Major Hurricane from now until Sunday when she is forecast to be approaching the southern tip of Florida. 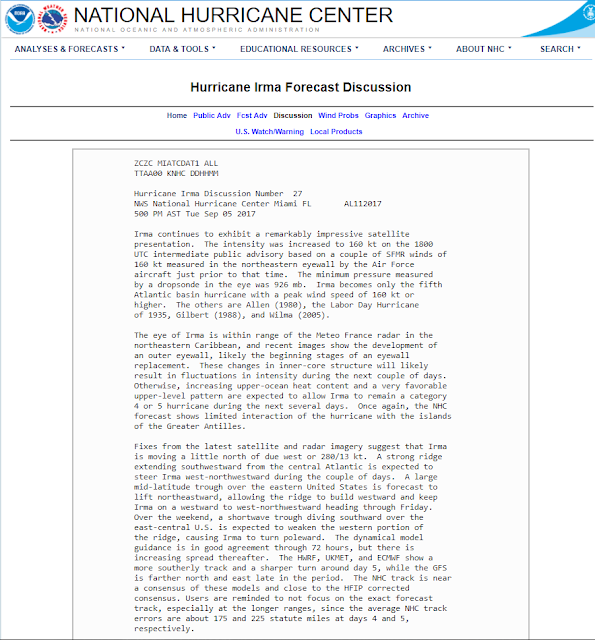 National Hurricane Center (NHC) Forecast Discussion. (Issued At 2 PM MDT Tuesday, September 5, 2017). 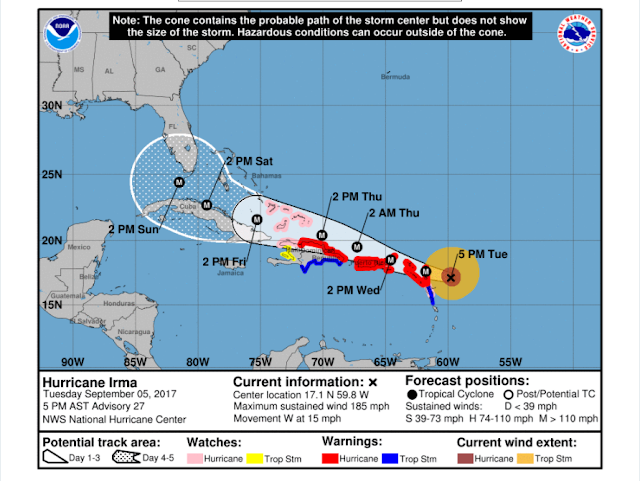 NHC Forecast Track Of Hurricane Irma. Valid At 6 AM MDT Saturday, September 9, 2017. Valid At Noon MDT Sunday, September 10, 2017. 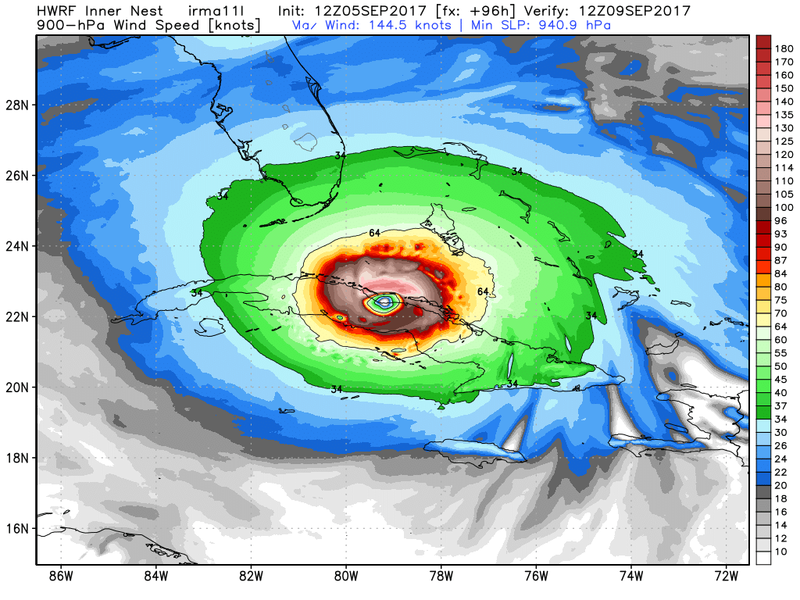 This mornings 12Z/6 AM MDT run of the HWRF model has Irma grazing the northern Cuba coastline Saturday morning and weakening slightly. 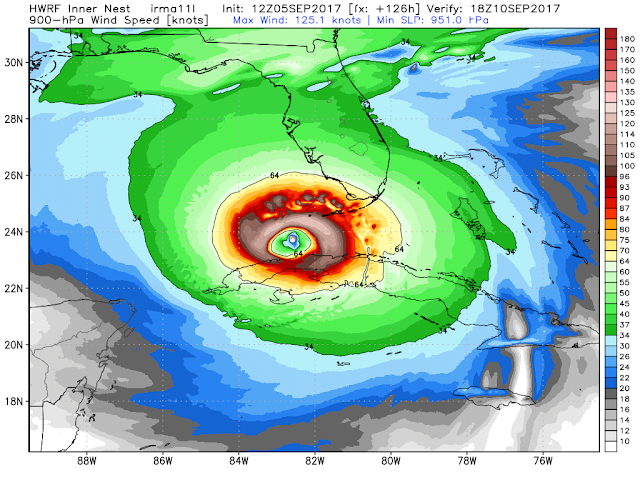 More disturbing is that this model then takes Irma northwestward towards the open waters of the Gulf of Mexico beginning Sunday. 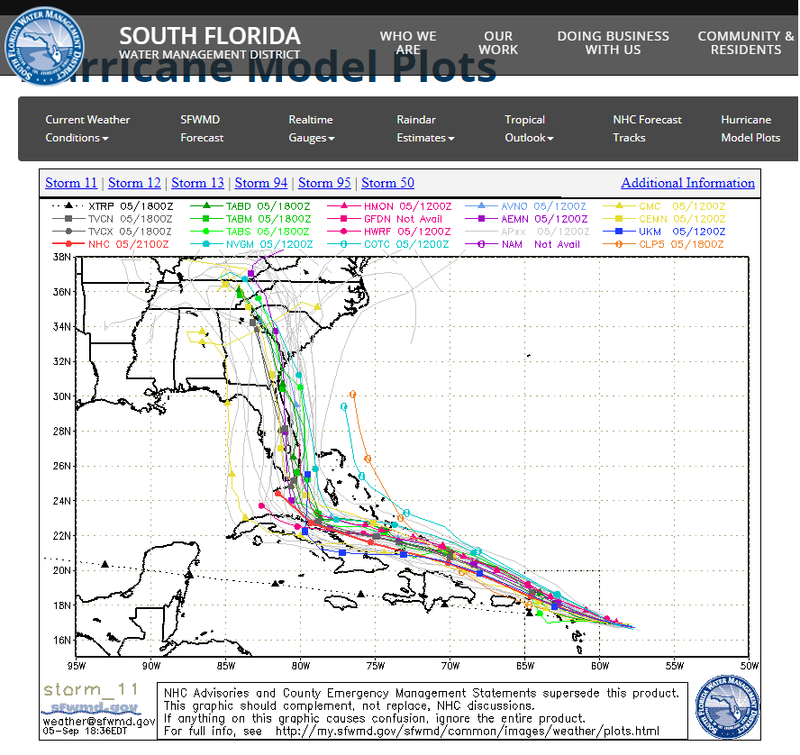 Again use a lot of caution with this model forecast. Its one model which is subject to change with time. At this point in time there is no guarantee that this model forecast will be correct. Valid At 3 AM MDT Sunday, September 10, 2017. NCEP's HMON model took a turn to crazy land with its forecast this morning. By early Sunday morning it has Irma very near the Miami area with sustained winds of 205 mph and a central pressure of 864.8 millibars or 25.54 inches of mercury. This simply would be off the scare as far as intensity is concerned. 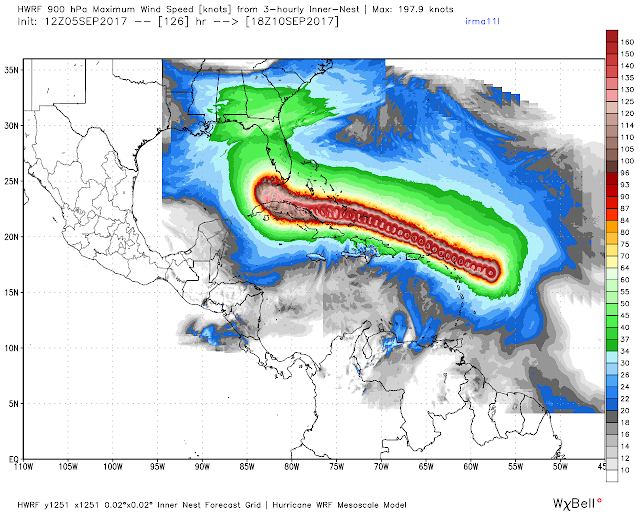 Again this forecast like the HWRF forecast is not an official forecast. Use these two models with a great deal of caution. There are no guarantees that this model will be correct at this time either. Valid At 6 AM MDT Sunday, September 10, 2017. 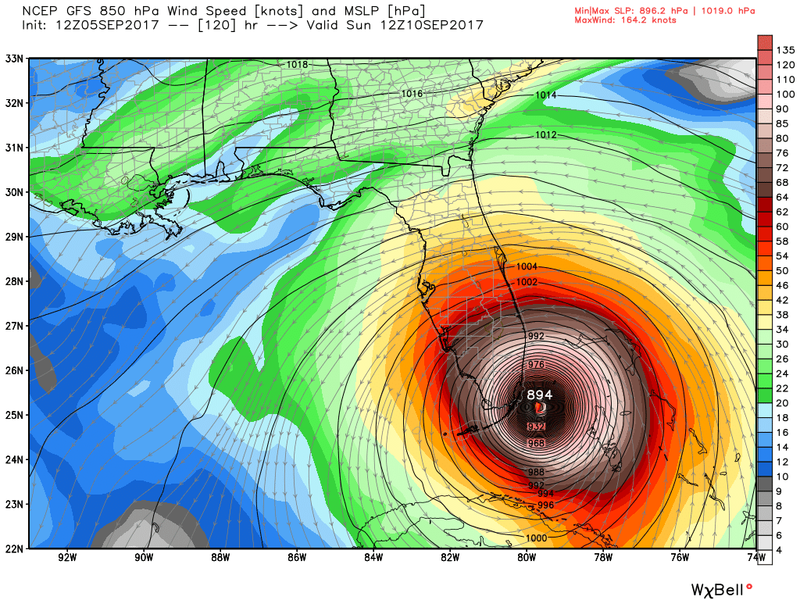 This mornings run of the GFS model also brings Irma dangerously close to the Miami area by around sunrise Sunday morning. 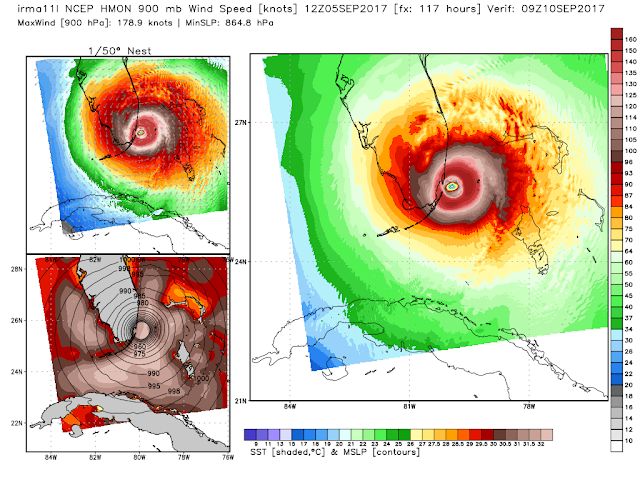 Similar to the HMON model it too gets crazy with Irma's strength at this time. This model forecast has Irma with sustained winds of near 190 mph (at the 850 millibar or 5,000 foot level) and a central pressure of 896.2 millibars or 26.46 inches of mercury. Like the HWRF model run this morning this mornings European model forecast also grazes the northern Cuba coastline Sunday morning but with a less intense Hurricane. 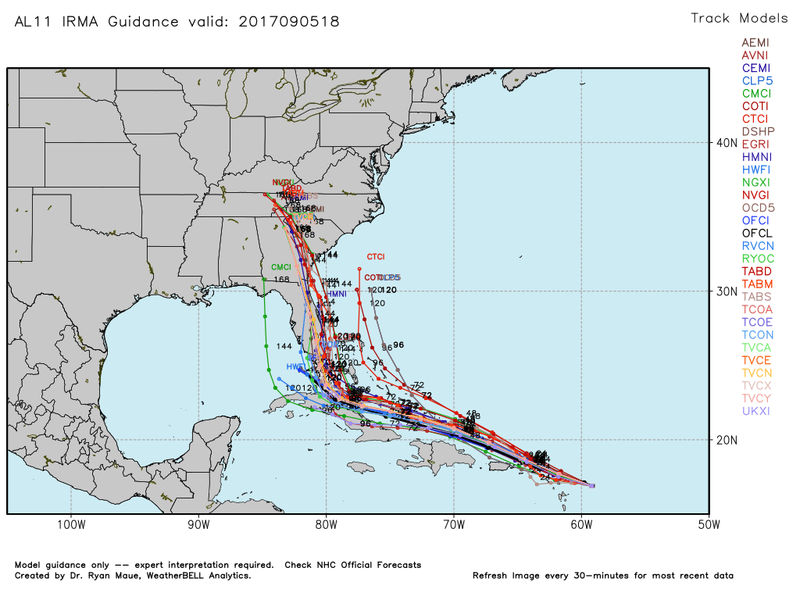 Hurricane Irma Model Forecast Tracks. 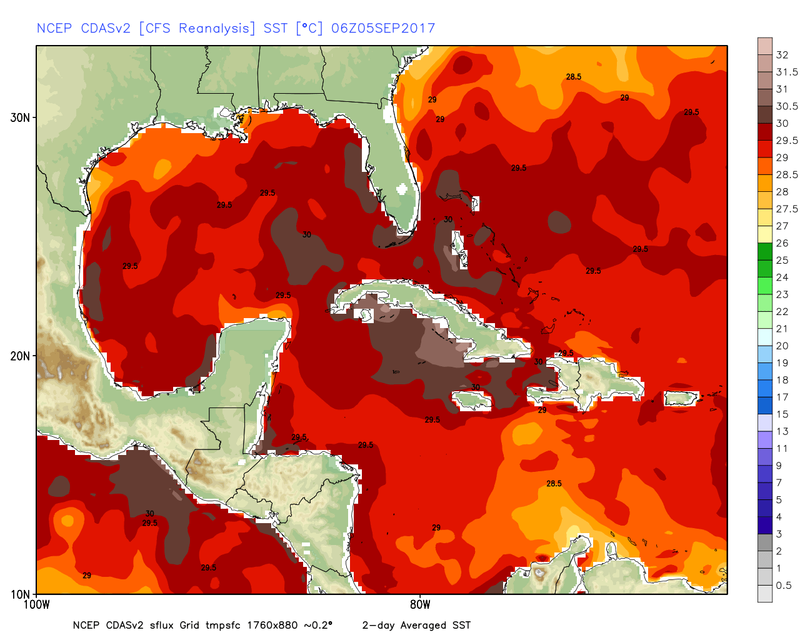 Hurricane Irma is already breaking records and there is a chance that she is not done yet. If you've been keeping up with my blogs you already know that the models have simply been wild in their forecasts with Irma's winds and pressures. She is over very warm waters so unless she slams into land (which doesn't appear likely anytime soon) she won't weaken much (if any) except perhaps with eye-wall replacement cycles. What is important to remember is that Hurricane Irma is already a monster of a Hurricane and she is a large Hurricane so impacts from her will be felt far from her center. She is not currently forecast to undergo any significant weakening between now and the upcoming weekend. 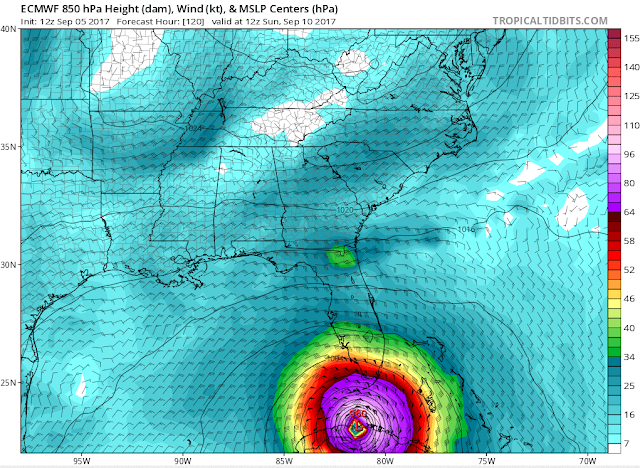 Meaning that when she begins to approach the southern tip of Florida she is still forecast to be a Category 4 Hurricane...possibly even a Category 5. Her forecast track for now appears fairly certain up until the begging of the weekend. 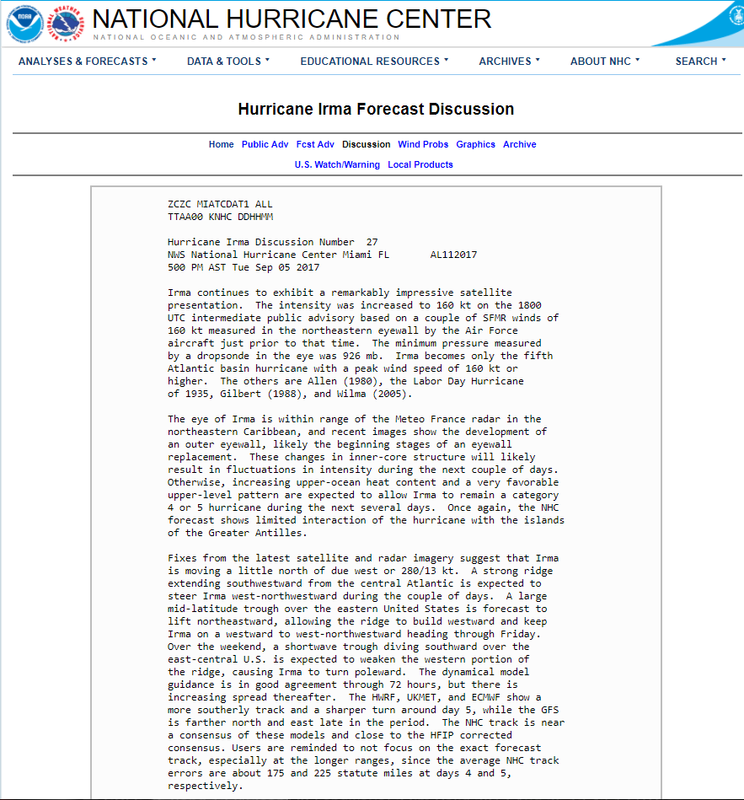 Please do not pay too much attention to the model forecasts beyond that. A lot can and most likely will change between now and then which could impact Irma's future track. Please use the official National Hurricane Center Forecast Tracks for your planning purposes. If you live in Florida, Cuba, the Bahamas, Hispaniola, Puerto Rico, or the northern Leeward Islands you need to be prepared for the possibility of the impacts from this Major Hurricane. 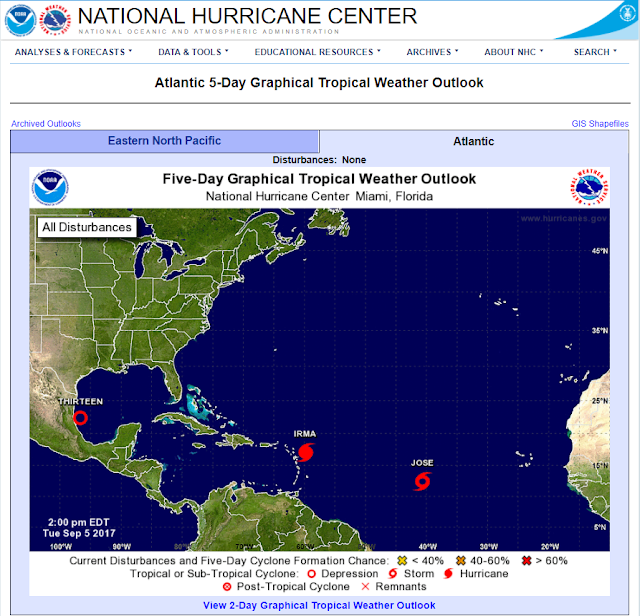 Click On The Following National Weather Service Office Web Pages For Additional Information.